Local choreographer Joseph Lee is holding a two-day contemporary dance workshop on 22-23 December, to share his thoughts gained from the exchange experiences in Europe, his current research and the artistic direction. Meanwhile, Joseph also wishes to meet and connect with local performers, seeking partners for his new creation premiered in September 2019 and upcoming production(s) in 2020. The workshop will utilize improvisation as devices, in search for the possibilities of bodies in motion, to connect the mind and the body, forming a dialogue. Research on creation topics in future production(s) will be conducted, discussing the topics and implementing trails in an open environment, to gain mutual understanding and explore the space for exchange in creation. Applicants with professional dance and physical training backgrounds are welcome to apply. Applicants must attend both two-days of the workshop. Suitable candidates will be invited, all applicants will receive an email notification before December 21 for the result. Invited pariticants will recevie the details of the event. Joseph Lee was a local choreographer, and began his dance training at the age of seventeen. He further his dance training at The Place, London Contemporary Dance School in UK, where he obtained his Master of Arts (Contemporary Dance) in 2015. Lee tried to expand the imaginations in dance with his choreography and dance by extensive collaboration with different art forms. Lee joined Unlock Dancing Plaza as an apprentice upon his return at the beginning of 2015 and became their resident artist afterwards. Recent Choreography includes It tastes like you (2016), Folding Echoes (2016), The World Was Once Flat (2018). Lee was awarded Arts Development Award for Young Artist; the Chin Lin Foundation of Emerging Choreographer. Lördagsgodis, the Swedish Saturday Candy. Bites of irresistible sweetness conceal the bewildering deception, sugarcoat fragmented memories. Chan graduated from The Hong Kong Academy for Performing Arts, majoring in Chinese Dance. From 2012 to 2014, Chan joined the DanceArt Hong Kong and performed in productions including In Search of Hui Sin, M-cident, and Lament of the Exile. In 2015, she joined Passoverdance and started creating choreography. Chan’s recent choreographies include the environmental dance Recycle Green presented in iDance Festival Hong Kong in 2015, and The 16th Day presented in The 44th Hong Kong Arts Festival in 2016. Other works include Whisper of Bubble, Fabric, He,She,It,Past,Chase and more. Chan is currently the Artist in Residence of Passoverdance. Moha, ‘delusion’ in Sanskrit, the agony of ignorance to the entire reality. The fog of fear, obligation, and guilt, a cage of blinded extortion. Mok graduated from The Hong Kong Academy for Performing Arts, majoring in Ballet and later in Modern dancer. Mok joined the City Contemporary Dance Company as dancer from 2007 to 2014. In 2015, Mok performed in her first choreography, A Major Clown in G Flat, in Femininity of E-sides Dance Company, and was nominated for Outstanding Choreography and Outstanding Performance by a Female Dancer in the 18th Hong Kong Dance Awards. In 2018, Mok was invited to the Hong Kong Dance Exchange Festival and 2018 Dance Round Table in Taiwan. In 2017, she presented her work You are Beautiful in The 45th Hong Kong Arts Festival. Currently, Mok works as an independent artist in different fields of performing arts. ‘New Force in Motion’ presents new dance works of emerging choreographers. It aims to offer a professional platform for young choreographers to showcase choreography, encourage development, and stimulate creativity through artistic mentoring and collaborative research. To continue the shared vision for dance development, and to facilitate the professional production process, the HKDA serve as the producer of the program again in 2018-19. Two young local choreographers, Gabbie Chan and Jennifer Mok, were selected by the LCSD Art Form Panel (Dance and Multi-Arts) from the proposals it received. 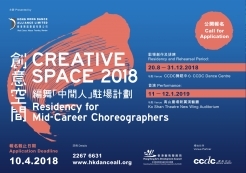 Presented by Dance Alliance, 'Creative Space 2018' is a residency programme targeting local mid-career choreographers. Participating artists will join regular workshops, technique classes and rehearse for the new work. The new work will be premiered in January 2019 at Ko Shan Theatre New Wing Auditorium. 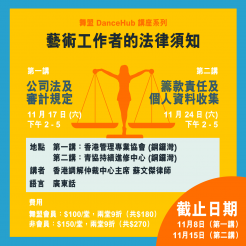 One of the choreographers – Chen Kai is now looking for a Male Dancer! If you are a professionally trained ballet and contemporary dancer, and are interested in the production, please apply on or before 1 July! It will be a solo contemporary dance work. Restricting within a suspended-position on the footprint, Chen Kai tries to apply linear movement to visualize the bodily limitation of trace-points in Kinesphere, and to free the imagination of extension-points in sphere, which symbolically comes along with a metal round object, to shape a space. Chen Kai has founded the Classifiable Movement to put his ‘Classifiable Movement’ theory into practice and visualize the concept of ‘let the movement speak for itself’. His logic thinking pattern cultivates the rational side of the dance and shapes multi-layers of movement analysis. He created his choreographic method of ‘Classifiable Movement’, which has been categorizing movements according to their features, namely linear, turning, twist, flex and rolling, etc. Focusing on merely one feature each time, a series of pieces has been developed - Line, Circle, Line and Aureola, Sweep (overture), Twist, Flex, Circle II, Line II, Sweep, Movement with Fan and so on. *Invited applicants will have to prepare a Solo of no shorter than 2 mins, based on his interpretation about Linear Movement during the audition. 1) Personal Contact, 2) CV, 3) Full body shot, 4) Solo dance video. 1. Applicants must be 18 years old or above by the start of the programme. 2. To fit the theme of the work, applicants must have strong professional background of contemporary dance and ballet. 3. Male dancer who has possessed professional contemporary or ballet training. 4. Applicants must be able to work according to the rehearsal and performance schedule. Photo: Zoe Ho. Henry Sum at Line II by Classifiable Movement. Established by Hong Kong Dance Alliance, Hong Kong Dance Awards Presentation and Gala Performance is an annual celebration of achievements by dance artists and organizations, as well as enhancing public awareness of the diversity and excellency of local dance scene. The 20th Hong Kong Dance Awards will present 14 awards, including Outstanding Choreography, Productions, Performance and Distinguished Achievement Award. This year, HKDA welcomes David Liu as the Artistic Director for the Gala. The Gala gives dance lovers a unique opportunity to enjoy performances by leading dance artists in one sparkling evening. Performing groups include Hong Kong Ballet, Hong Kong Dance Company, City Contemporary Dance Company and The Hong Kong Academy for Performing Arts. A Breakthrough in your choreographing career? A Platform to enrich your creative process? An opportunity to join regular technique workshops? Check out the Creative Space 2018: Residency for Mid-Career Choreographers program! Presented by Hong Kong Dance Alliance, the 5-month Residency targets local mid-career choreographers. The Residency will take place from August to December 2018 at CCDC Dance Centre. The artists-in-residence will join regular workshops to strengthen their techniques, research and consolidate their artistic concepts for the new dance piece. The Alliance will provide administration, production and artistic support. The double bill will be premiered at Ko Shan Theatre New Wing Auditorium on 11-12 January 2019. To apply, simply submit your 1) Online application form, 2) CV and 3) Past productions’ video links on or before 10 April. The results will be announced in May 2018. Panel committee: Angela Hang, Founder of Studiodanz, Yang Yuntao, Artistic Director of Hong Kong Dance Company, Veteran Arts Practitioners Daniel Yeung and Joanna Lee. 1 November 2017, Hong Kong – Hong Kong Dance Alliance (HKDA) announces the Call for Nominations for the 20th Hong Kong Dance Awards. Marking 20 years of excellence, Hong Kong Dance Awards pay tribute to outstanding work of individual artists and dance organizations in productions throughout the year, as well as acknowledge distinction in other activities related to dance and the Hong Kong dance community. Artists honored in the past include Lau Siu Ming, Willy Tsao, Helen Lai, Yuri Ng, Mui Cheuk Yin, Jean Wong, Aaron Kwok, and Jackie Chan. The 20th Hong Kong Dance Awards Presentation & Gala Performance will be held at Kwai Tsing Theatre Auditorium on 20 April 2018 (Friday). Nominations in twelve award categories are open for submission by anyone – from dance practitioners to audience members. Following the close of nominations, a shortlist, determined by balloting distinguished experts in the dance field, will be announced in early 2018. As in previous years, this year’s Expert Panels have been expanded to further enhance the representativeness and diversity of the Awards. To celebrate this special anniversary, the Hong Kong Dance Alliance Executive Committee are pleased to announce the establishment of an additional award intended to draw attention to the work of new choreographers. The candidates of “New Choreographer Award” will be nominated by the Expect Panel and Executive Committee members of the HKDA, the recipient will be announced at the Presentation. Nominations close on 3 January 2018 (Wed). Interested parties can complete the Nomination Form and submit via 1) email, 2) Google Form, or 3) by post to 7/F, 26-28 Tai Yau Street, San Po Kong, Kowloon by 6pm on or before that day. 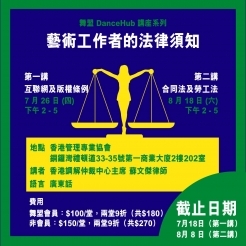 For Hong Kong Dance Awards 2018 Procedures and Rules guidelines, please click here. For complete Press Release, please click here. Any enquiries can be directed to admin@hkdanceall.org.